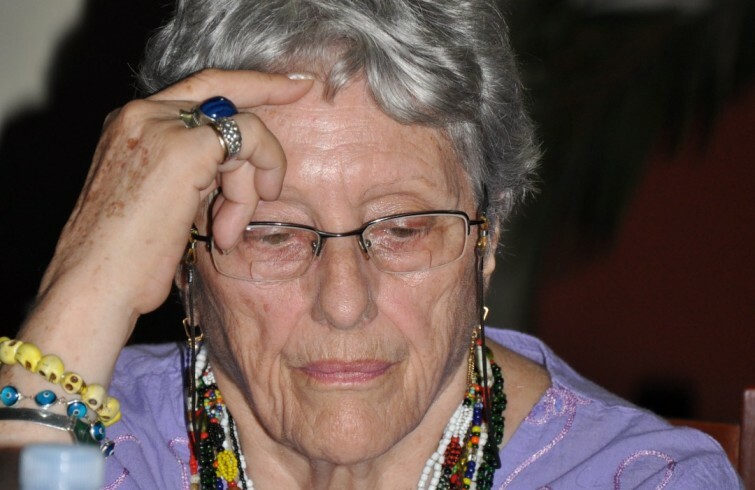 Judging from the irreverence that has been the hallmark of her entire life, Natalia Bolivar Arostegui (1934) doesn’t strike one as someone who was born in Havana’s aristocratic neighborhood of Miramar, whose garden walls are as impregnable as its safe deposit boxes; she appears rather to have been born in the more proletarian quarters of Pogolotti, where dockers return to put an end to their rumba-filled nights – or rather returned, for it’s been several decades since she was last inclined to visit Havana’s more picturesque neighborhoods on “anthropological impulses,” as she puts it. If there’s one description that does not fit her it is that of the serene and lethargic old woman sitting on the armchair of nostalgia. There is still much blood coursing through her veins, and the memory of that unrepentant young woman who added more fuel to the fires of the 1950s, becoming involved with Jose Luis Gomez Wanguemert, a married man who was a known opponent of dictator Fulgencio Batista, is still too vivid. It was, as they say, quite the scandal at the time. “My first memories are of my nanny, Isabel Cantero, who took care of me from the day I was born. She raised me and my brothers and helped me raise my three daughters. When I was born, in 1934, she was the nanny they’d found to take care of us. She’d grown up hearing her Congolese mother’s stories, where everything came alive, and she would use these as bedtime stories. She was an exceptional woman, a short, stout black woman who always wore white. She was so small she dragged all her uniforms across the floor. My interest in studying Afro-Cuban culture comes from her. “I’ve always moved in folklore research circles, though my mother didn’t quite approve of this. Unexpectedly, I managed to delve more deeply into these issues when I started working at the National Fine Arts Museum in 1954, while it was still being built. I was interested in the museum because it was originally built to house an archeology, architecture and modern art wings, as well as the Count of Laguinillas’ Egypt, Greece and Rome collections, plus specimens of English, French and Spanish art. In short, it had a whole world of subjects to study. What’s more, Lydia Cabrera was working there at the time. Owing to the significance of African traditions within Cuban culture, she managed to secure a wing of the museum to set up exhibits dealing with the four main religions inherited from Africa that were practiced in Cuba. “These religions had such a powerful impact on our culture and ourselves – those of us born today and those who were born back in the day of Andile – that there is no way to tell the story of Cuban culture without speaking about black culture, you simply can’t. That was also what that wing at the Fine Arts Museum sought to reflect. We are part Spanish, but African culture has had a very strong influence on us, particularly on the way we express ourselves, our gestures and music. “As I was telling you, I was a follower of Lydia Cabrera. She was the world to me. There are two research methods, see: a scientific one and one based on oral traditions. The queen of oral tradition studies is Lydia Cabrera, and the king of the scientific method is Fernando Ortiz. If you don’t study the works of Lydia Cabrera and Fernando Ortiz, you’re out of the game by default. You can’t stick to just one school of research. With all of her wisdom, Lydia never managed to formalize a single name or anything, she only passed on the oral traditions she collected from the descendants of slaves and the slaves she managed to meet. Her work is very important because it documents the living voice of slaves, of their religion, without interpretations that were based on her knowledge. I’m always saying it: I was a disciple of Lydia Cabrera’s. No, I was Lydia’s lapdog. I was only 19 or 20 at the time. She decided to leave Cuba and I decided to stay. I respected and still respect her decision, because I believe that, if there’s one person who’s made a huge contribution to Cuban culture, that person’s name is Lydia Cabrera, and that’s deserving of admiration. We’d had our ups and downs over these past 50 years or more, and she was persona non grata here, until my book, Los orishas en Cuba (“Orishas in Cuba”) came out. “Whether people like or resent it, it’s a fact my book, Los orishas en Cuba, opened the way. I started writing the book in 1980. At the time, I worked at Havana’s National Theater and the directors there were driving me crazy. “Natalia, do something to relax,” they would say to me. I was their advisor for the religious aspects of their works. I would take their scripts (I have them all put away) and would study the characters. Then I would start drawing a flow chart on huge sheets, showing the characteristics of each deity – the food they ate, their colors…in short, they encouraged me to write a dictionary, a glossary, containing all of that information, so they could use it as needed. Ultimately, I am happy I finally took their advice. I wrote the book and haven’t changed it, even though it’s been re-edited several times. The first edition of Los orishas en Cuba includes 21 deities. It now has more than 50. The number has grown because we’ve documented more and more orishas. “After working hard to finish the book, organizing the information so it could be read by people like a story, I approached the Association of Cuban Writers and Artists (UNEAC), where Reynaldo Gonzalez was working, to see if they would publish it. He read it one night, called me and said to me: “I’ll be at your place tomorrow at eight in the morning. We’ll organize this and the glossary a bit better.” Reynaldo was leaving his position as editor in chief for UNEAC and was starting a different position. He left everything ready for publication. But, if you can believe this, they cancelled the publication when the book was at the printer’s. The book was put on hold for three or four years. “One day, I went to one of my godfather’s place and he says to me: “Come, Natalia, I’m going to treat you to a beer at a bar.” I went off with him to have a drink. He was one of the people who kept me informed about developments, and he’d often invite me to lunch in Old Havana. So I went to the bar and said to him: “Ok, we’ve had our beer. When’s the steak coming?” He says to me: “Wait, wait just a moment.” Suddenly, a man holding a box full of books comes in through the door. “Look at this and don’t say a word.” The man who’d come in started pulling out Lenin’s Complete Works. I said to my godfather: “What’s this got to do with me?” He was selling each of Lenin’s volumes at 100 Cuban pesos, which was a fortune at the time. When the man left, my godfather asked the barman to show me one of the books. It was Los orishas en Cuba. Without having been launched by UNEAC, they were already being sold with the book cover of Lenin’s Complete Works. So I took one of the books the man was selling, who lent it to me after I gave him my ID and everything, and headed to UNEAC to kick up a fuss about it. “I got there and all of the editors were gathered there. I threw the book at them and said: “Let me get this straight: you shelved my book three or four years ago and now the book’s being sold at 100 pesos.” When they found out they were illegally printing the book, they put a stop to it and started to assess the damage and restrict its sale, to find out why it hadn’t been published officially by UNEAC and was being sold illegally. It was then that I found out a person had dared accuse me of plagiarism, which is why they’d decided to shelve the book. When they called Reynaldo, he’d said to them: “What plagiarism, what are you talking about?” They replied that in such and such a page, I hadn’t given credit to Lydia Cabrera for a quote and plagiarized En los caminos de Oshun y Yamaya (“Down the Paths of Oshun and Yemaya”). They went on until Reynaldo told them to look at the material in its entirety, so they would see that the quotations were in order. The issue of the quotes was cleared up, and that was when I presented Los orishas en Cuba, which amounts to a declaration that the religions of the people cannot be hidden. “The book opened doors for the whole issue of popular religion. There was a time no one forbade religion explicitly, but you would fill out an application to work somewhere and the form asked: “what religion do you practice?” If you checked Santeria, you’d never get a job, not even to mop floors at a bar. They wouldn’t say it outright, and one was religious. So people started practicing double standards. “No, I don’t go to church,” people would say. I had friends who were Party members and had to get married in a Catholic church in a neighborhood very far from theirs. “My research into Cuban folklore became more intense after I started working at the Fine Arts Museum. In fact, when the revolution triumphed, since I’d worked there in the past, I was deployed to take the museum, with weapons and all. I was tasked with getting Batista’s police out of there and take control over the museum. Everything was going well until 1966, when they started a campaign to sell works of art at the museum. They fired me from the museum for refusing to sell the works of art I had worked so hard to secure for the country’s museum collections. I refused, so, what did they do? They got me out of there and sent me to the cemetery, to restore tombstones. “I had just returned from Paris, where I’d met with artist Wifredo Lam to organize the Salon de Mayo exhibition at La Rampa. As it turns out, all of the artists who participated at that mural painting event went to the cemetery to see me clean tombs. They’d first met me when I was still the director of the Fine Arts Museum. Those were tough, very tough times. We lived through very tumultuous periods. A revolution changes everything: society, the economy, and very dumb, short-sighted people looking to climb the ladder act in politically opportunistic ways, and those of us who weren’t guilty of anything sometimes got hurt. All I’ve done my entire life is work to better Cuban culture, nothing else. No one can accuse me of ever having sold or stolen a painting, and I could have done so easily and quickly. “If I told you the Directorate has been given the credit it deserves, I would be lying to you. I always say I was, am and will always be a proud member of the Revolutionary Directorate. I helped all the others, but let there be no mistake: my comrades are my comrades. My years at the Directorate were both the best and worst of my life, that is the truth of it. It was when I fell in love with Jose Luis Gomez Wanguemert and, as I said on a TV show (and get asked about this constantly now), after Wanguemert, that was that. Tragically, I saw him die. “The day they attacked the house of government, he went by the Museum and said to me: “Nata, don’t even think of going out, don’t go out no matter what.” I asked him what was going on, why so much secrecy. Then he left. A while later, I was at the second floor of the museum giving a group of tourists a tour when I heard the explosion. We all dropped to the floor. I looked outside, naturally, anxious, because I knew something big was going down. From the museum, I saw everything, I saw him shot down. When they came to tell me, I already knew he was dead. “Let me tell you, my girl, one can have many affairs, but that kind of love, the one that splits you in two, you don’t ever get over that. My two older daughters say that their father is the best thing that’s happened to me, but there are love stories and then there are love stories. That was very hard for me. He was very charismatic. I’ve never met anyone like him; he had an answer for everything, a very Cuban sense of humor. He was the kind of typical Cuban who always had a cigar in his mouth, a man who was very spontaneous and educated. There are men you simply cannot get over, no matter how hard you try”.